Everyone could do with some more cash. But you don’t need to ask for a raise to generate more cash flow. In fact getting a raise is not the answer. Your spending always seems to go up commensurate with your pay rises. You are probably earning today what a few years ago you were absolutely convinced would be the perfect amount that you could live on, but you still might find yourself still struggling for cash. You need to be smarter with your money. Sometimes it’s the simple things you can do that make a difference. You have money hidden away and you don’t even know it. And if you didn’t miss it before, you can now put it to better use. Find your hidden money, which can then be channelled into savings, reducing your debt or both. 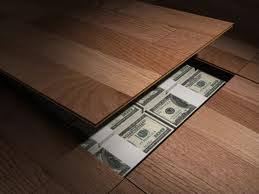 There are always ways of finding some spare cash, which can be put into savings or debt reduction. Firstly, do a quick monthly budget to see where your money goes, especially the small things purchased that you don’t think about. That chocolate bar here, magazine there, the 3pm coffee to stay awake at work, the takeaway on the way home because it was too much trouble to cook that evening. These all add up. I’ll go into more detail on budgets in another post, but just record ALL expenditure you make in a month. You’ll be amazed to see where your cash just gets frittered away. Consider whether you really need that chocolate bar you’re thinking of buying when paying for petrol, or magazine while at the supermarket checkout. Think of bringing your lunch in to work at least a couple of times a week instead of buying it every day. And buy a jar of nice coffee and keep it in your drawer, and use that instead of going and buying a takeaway one. The added benefit here is that you’ll use your own mug instead of throwing away a single use cardboard coffee cup. Another area to look at is to go through your “stuff”. Everyone has things they no longer need or use. Look through every room in your house, from your bedroom wardrobe to your kitchen cupboards and especially your garage. Now, consider selling these items or having a garage sale. Investigate things like eBay, Gumtree, Traderoo and your local area sell pages on Facebook (usually called buy/sell/swap) to list your items. One person’s junk is another person’s treasure, so it’s a double benefit. And the fact that you’re also decluttering is a triple benefit and also good feng shui. But do not fill the newly available space with more “stuff”, which defeats the whole purpose of the exercise. There are obvious ones like quitting smoking if you’re a smoker and perhaps cutting down on your alcohol purchases. Double benefit again, your health improves as well as your hip pocket. Walk that short distance instead of taking the car. Take a few minutes before going shopping to plan your meals ahead of time so you won’t be tempted to buy takeaway. Buy only what you need, if you go with a shopping list, you’re less likely to put those impulse things into your trolley and here’s an old but tried and tested trick. Don’t go shopping when you’re hungry, so you’re less likely to put snack products into your trolley. Drink water instead of buying sugary soft drinks. There’s that health benefit/save money thing again. Then there is also trying not to “keep up with the Joneses” as it were. You don’t really need to rush out and get the latest gizmo, gadget or doodad when the one you have now is just fine. Replace it when you need to, not because we want to impress people. In Thomas Stanley and William Danko’s book The Millionaire Next Door, they found that most millionaires lived modestly and frugally, drove older cars, flew economy class and lived well within their means. Will Smith said it best when he said “Too many people spend money they haven’t earned, buying things they don’t want to impress people they don’t like” or words to that effect. I’m not advocating being a miser and never spending anything other than for essentials. You do need to reward yourself with an occasional treat every now and then, but the operative word here is occasional. If you see something you must have, I suggest you try this to gauge how much you really want it. Leave it for a day. Sleep on it, and put it out of your mind. If you still really want the item and it’s a must have, then you know it is something you will appreciate and is not just an impulse buy that you might regret later on. Then by all means buy it. There are so many things to consider here, the ways to save money can fill many books, but start thinking about areas where YOU can save money, and if you start by recording every single purchase for a month, even that packet of chewing gum, this will make it much easier when we tackle doing a budget and starting a savings plan in other posts. Read published article on LinkedIn. Also read the published article on Ezine Articles.